The planet is warming and Arctic ice is melting. These facts are hardly news. But it’s not just habitat for polar bears that’s being lost—a piece of Earth’s history is disappearing, too. You’ve probably never heard of the Barnes Ice Cap, a Delaware-sized glacier located on a remote island in the Canadian Arctic, and you might not think much of it if you flew over head, across the endless sprawling landscapes of rock and ice. You might not know, for instance, that it’s the last surviving fragment of the Laurentide Ice Sheet, which blanketed North America from Alaska to Iowa to New York at a time when the land belonged to mastodons, dire wolves, and saber-tooth tigers. But, if you visited a few times, over a few years, you might notice that the ice is vanishing. The Barnes Ice Cap survived the end of an ice age and then a few millennia, but it won’t survive us. That’s according to model projections led by researchers at Simon Fraser University in British Columbia and published this week in Geophysical Research Letters, which predict the ice sheet will be gone in a few centuries. Most of us, of course, won’t notice its absence, and its contribution to sea level rise will be tiny. But the fact that Canada’s oldest glacier is now melting makes the cap yet another poster child for changes taking place around the Arctic and across the planet. From 2.5 million to 12,000 years ago, much of North America was covered by a vast ice sheet, which grew and shrank as the Earth cycled between glacial (cold) and interglacial (warm) periods. During the height of the last glacial period 21,000 years ago, the Laurentide Ice Sheet buried Canada, New England, and the midwestern corn belt under literally thousands of feet of ice. Then, around 11,000 years ago, glaciers worldwide started to retreat at the onset of the Holocene. The Laurentide Ice Sheet entered a state of “irreversible decline,” shrinking until eventually, it was a shadow of its former self, a single island-bound glacier high in the Canadian Arctic. Having already determined that the ice cap is disappearing, in the new study Miller’s team decided to look forward and see how long it’s got left. If we cut our carbon emissions fast, the researchers found, the Barnes Ice Cap will probably hang on for another 500 years. If we keep burning coal like there’s no tomorrow, it could be gone in 150 years. Most likely, it’s got another three centuries before it vanishes entirely. 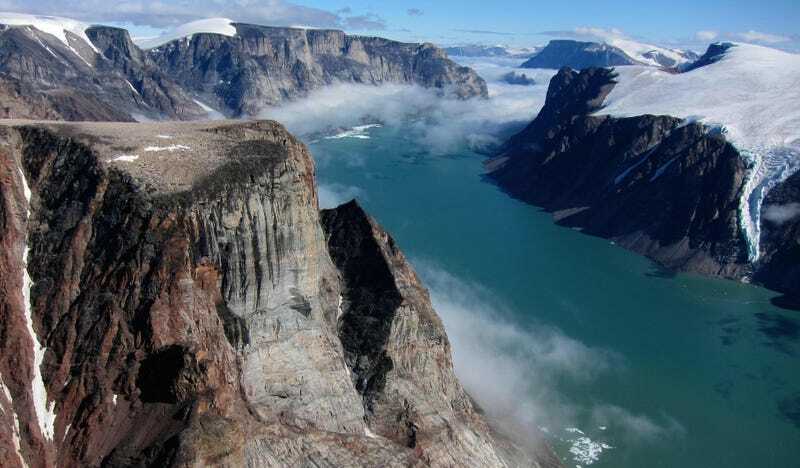 By measuring rare isotopes collected in rocks exposed by the glacier’s retreat, the researchers concluded that this geologic relic has only vanished once or twice, tops, over the past 2.5 million years. “We were not expecting that—basically, these rocks were almost never, in the last 2.5 million years, exposed,” Miller said. He noted that during the two previous warm periods where the ice sheet might have melted completely, our planet was on an orbit that brought it much closer to the sun in the summertime. In other words, the ice cap’s present-day demise is weird. Again, the loss of this glacier is small potatoes for humanity—we’ve got much bigger concerns on our hands with the potential collapse of the West Antarctic ice sheet, which could raise global sea levels by four feet in the coming centuries. But as Miller himself put it, events like this are a warning sign. What Happens When That Enormous Antarctic Ice Shelf Finally Breaks?